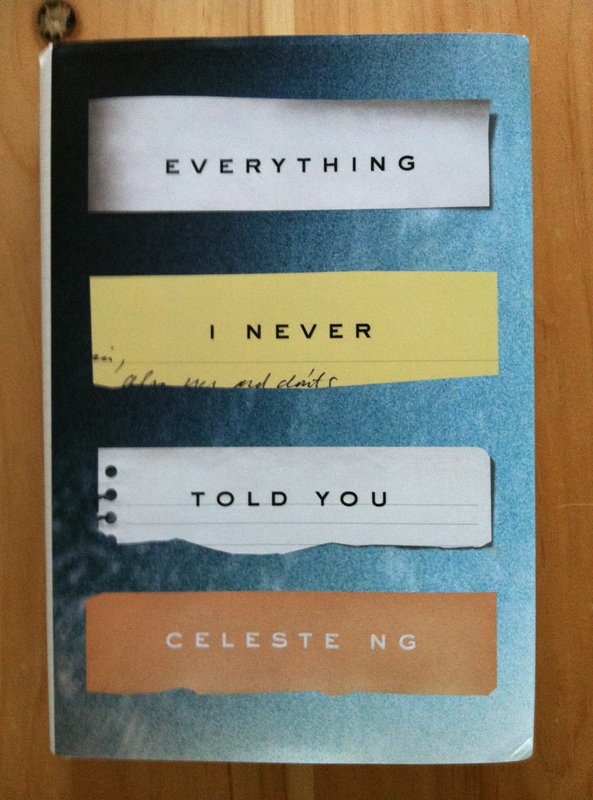 I admired so much about Celeste Ng’s debut novel, Everything I Never Told You*: the seemingly effortless structure that passes seamlessly between decades; the rounded, careful characterizations; the gradual revelation of a loving family’s best-kept secrets. When I first heard about Everything I Never Told You, I was in equal parts eager and nervous about reading it. Eager because the praise was already coming in, and because I recognized Ms. Ng’s name; we attended the same high school and edited the same high school creative arts magazine (four years apart; we’ve never met). And nervous because, given the book’s opening lines (“Lydia is dead. But they don’t know this yet.”), I thought that I might be reading something akin to The Lovely Bones, and I wasn’t sure I had the emotional energy in reserve. As it turns out, I needn’t have worried. Everything I Never Told You is a nuanced portrayal of the ways in which a family copes with a loss both profound and mysterious. It’s also an exploration of how that family came into being, and how the histories of parents shape their children. It’s a novel in which a skillful writer reveals that privates dramas — made of extraordinary-ordinary stuff, no skeletons in the attic — are astonishingly compelling, and astonishingly important. In their small Ohio town, the Lees stand out as the sole Chinese American family, a distinction that causes difficulties for them, to say the least. James Lee is the son of immigrants (their story, given in brief, is both poignant and gripping, and made me want to hear more about them); Marilyn was raised by her mother and dreamed of becoming a doctor before marriage and motherhood derailed her plans. James respects his wife’s intellect, and did not deliberately keep her from a career; like so many of us, the Lees make their decisions about work and family with practical exigencies in mind and ideal scenarios too far out of reach. The three Lee children are Nathan (Nath), Lydia, and Hannah. Nath looks forward to leaving for Harvard in the fall; Lydia struggles with her parents’ expectations; and little Hannah is at once nearly invisible and the one who sees best what’s going on around her. One spring morning in 1977, the Lee family realizes that Lydia is missing. Once her body is recovered, each member of the family starts to look for answers, but their searching reveals just how much has been unspoken among them, and how difficult it will be to knit together an unraveled family. I love the detail here, and the way Ms. Ng lights on these two sad figures for just a moment, to give us a sense of what a small moment of loss feels like, how it looks. Everything I Never Told You is a novel that asks us to examine how we define our own success or happiness, to wonder what it means to belong (in all the senses of the word) and to try mightily to understand each other better. Highly recommended. Bostonians: You have two opportunities in July to hear Celeste Ng read from Everything I Never Told You! The synopsis reminds me very much of Alice Sebold’s The Lovely Bones. I actually thought it was so boring; I couldn’t finish it. However, since this novel focuses on an immigrant family and how they define success/happiness, it sounds much more interesting. I’ll definitely add this to my TBR. I’m going to have to read this one. This one is already on my list so I’m so glad you liked it. It’s gorgeous. Hope you like it! I’ve been hearing a lot of good things about this one recently. I wish I had picked up the ARC when I had the chance to. And what a small world that you went to the same school as the author! It’s gorgeous — I think you’d love this one. When did you have the chance to pick up the ARC? Just got through this. It’s beautiful. (I keep reading books you post about instead of the Margaret Atwood novel that I’ve been working on for a month, though I’m loving that one too.) There was a passage near the end that I particularly love about Lydia looking at the newly leafed-out maple trees and watching a helicopter fall to the ground. That’s so engrained in my Ohio experience, and it was so perfect. I love that passage too! I’m so glad you’re finding books that you like!